After spending three years in the shadow of stars such as Andrew Luck, Jonathan Martin, and David DeCastro, Taylor is shining bright in his senior year. Taylor is really a jack of all trades. He does everything well, but nothing great. This leads to great results, but not too many highlight reel moments. The Cardinal running back really reminds me of former University of Cincinnati and current St. Louis Rams running back Isaiah Pead. A very good running back who entered his senior year as a likely second-day draft pick. That is not the case anymore. America saw what Taylor is capable of as he shredded the vaunted USC Trojan defense under the bright lights. 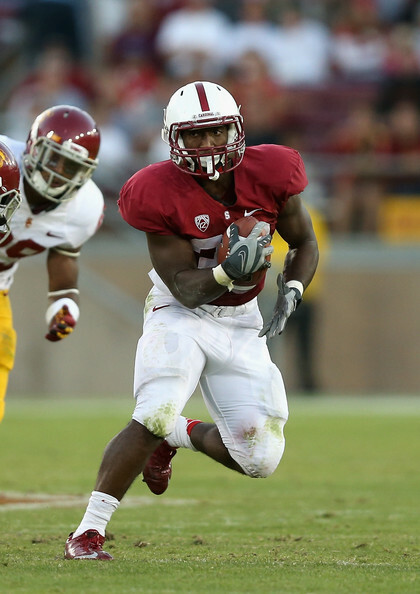 Taylor is the main reason why Stanford finds itself with a top-ten ranking, despite the absence of Andrew Luck. Maybe the post-Luck era won’t be so bad after all in Palo Alto. At least this year, they have a star in Stepfan Taylor carrying the load on offense. Also, do not sleep on this kid turning into a major factor in the Heisman race if Stanford can somehow find a way to take down Oregon on November 17th in Nikeville. Who else is tired of lockouts in professional sports? Hopefully the NHL one is very short-lived and Canada’s favorite pasttime is up and running at some point this season. Four shutdowns in 20 years is a major problem. A permanent fix needs to be found. Sports, like everything else, are all about the money sadly. Anybody who claims they envisioned the Arizona Cardinals going into Gillette Stadium and taking down the mighty Patriots in their home opener is full of it. Arizona has now won nine of their last eleven games (dating back to last season), and have not surrendered more than 23 points in any of them. Tom Brady is now 35 and 2 in his last 37 home starts thanks to the Cardinals defense. Maybe the Arizona D is the real deal? A dynasty in the City of Brotherly Love? The Philadelphia Eagles are 2 and 0. Let me repeat that. The Philadelphia Eagles are 2 and 0. It is the first time the team out of the City of Brotherly Love has started a season with consecutive victories since 2004. I think you all know what happened that year. They represented the NFC in the Super Bowl. Maybe a dynasty is coming? Notre Dame slayed the mighty Michigan State Spartans at Spartan Stadium on Saturday night. Now the Fighting Irish head into their annual battle with Michigan a very confident 3 and 0 team. Perhaps the third year will be the charm for Brian Kelly in South Bend? This entry was posted in Miscellaneous and tagged Andrew Luck, Arizona Cardinals, Brian Kelly, David DeCastro, Gillette Stadium, Isaiah Pead, Jonathan Martin, Michigan State Spartans, Michigan Wolverines, New England Patriots, NHL, Notre Dame Fighting Irish, Oregon Ducks, Philadelphia Eagles, Stanford Cardinal, Stepfan Taylor, Tom Brady, USC Trojans. Bookmark the permalink.